I am ending the series with another Tigger card. I guess I never knew he was so popular and seems to be the most favorite of Pooh's friends. 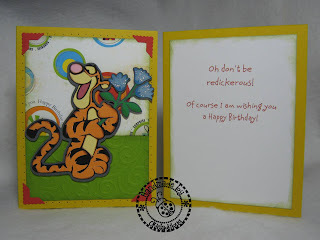 I just had to use Tigger's "redickerous" word for this card! And my daughter laughed when she read this one, saying she forgot about him saying it until she read it. The patterned paper is Bo Bunny and the green cardstock is Prism. The yellow is Stampin Up! Crushed Curry. I used the D'Vine Swirls Cuttlebug folder on the green cardstock. Again I would say if you are going to do a Tigger this small I would start at the head part with the orange layer. I do have to say he still was not as difficult as that horrid Tinkerbell *okie wonders how much hate mail she will get for calling Tinkerbell horrid* to cut and put together. I did have to use a poky tool to get the eyes out a little bit, but even that wasn't hard. I added some Stickles to the flowers for a little bling and of course you guys know my feelings about Stickles! I use Diamond the most because of how it looks when used on colored cardstock. I do have quite a few of the colors but I always grab the good ol' Diamond! I did add the shadow layer to Tigger and the flowers on this one because I didn't want him to blend into the patterned paper too much and also I needed the extra thickness to help stabilize the cuts since I pop dotted them off the card. The photo corners were made with an EK Success punch. I made a few cuts along the cut line of Tigger's paws so I could slide the flower stem in there to make him look like he was holding the flowers, and it worked out pretty darn good! If you would like to make your own Tigger cards then you can download the cut file or Gypsy file. Like the others in the Series both Tigger cards are in one file. I hope you guys have enjoyed the cards from the Winnie the Pooh series! I will be starting a new series in a few days with.......*okie smiles big and then cracks up laughin* I am not gonna tell you! You will just have to come back and see what I use! I love everything about this card! The colors are so bright and cheery! Can't wait to see what your next series is. I think you should keep with the Disney theme. Perhaps a weeks worth of Tinker Bell cards!!! Too cute! Im a stickles fan too and also looooovvvvvee diamond. Tigger does have lots of great sayings - love this card too. The entire "series" is great! LOVE, LOVE, LOVE TIGGER!!! and I had forgotten about "redickerous" too until I saw the sentiment - TFS!! I have really enjoyed your Pooh series. The cards have brought a BIG smile to this 65 yr old crafter. So thank you!!! Okie, I enjoyed your Pooh and Friends series a lot!! I look forward to your next series. I have to also say I love reading what you're thinking as you type out your directions. I have loved every card in your Pooh Series! Thanks for always being a bright spot in my day! These were all fantastic! You are such a tease I cannot wait to see what the next series is. this is just toooo cute. AND how sweet to share the .cut files. Love the Tigger cards! I really thought you would make a Hefilump card, too! LOL Can't wait to see what your next series is! Okie I am blaming you for the fact that I had to buy this cartridge. Tigger was always my favourite character. Hopefully your next series will be a cartridge I already have. LOL. Really love it!!! 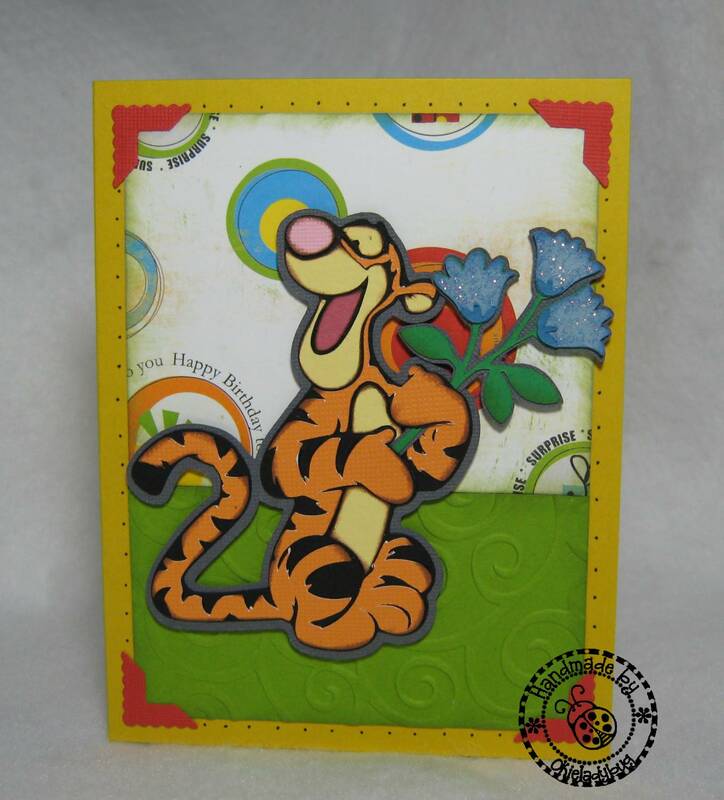 Tiggers so cute...grrreat card!! I love it! Looking forward to seeing your next series! Last of the series, maybe, but definitely not the least and it's sure NOT "redickerous" either!!! You are ending with a bang ... this is my favorite of all the Pooh cards you made so far. I still hope you'll get around to doing the baby Pooh characters too, but maybe that will be another time. Anyway ... It's another GREAT card! I love Tigger and am glad to here he is easier than horrid Tinkerbell. I agree she was hard and I haven't used that cartridge since. Bad me I should try again. I love this series of cards, you are such a talented person. I love all the papers, you have used with this series. I am off to shop online to see if I can find the papers and the some of the other tools you have used. TFS and for enabling me. WOW tigger holding that rose is priceless!!! just another great card, i love it!!!!!!! Love, love, love this card! I like how you made him look like he was carrying the flowers. I've really enjoyed your Pooh card series! !